Faculty of Health (FKes) of Universitas Dian Nuswantoro (UDINUS) Semarang inaugurated and took the oath of prospective graduates, on Thursday, 23rd of August, 2018, at Grasia Hotel, Semarang. There were 127 prospective graduates in total which consist of 57 prospective graduates of bachelor degree of Public Health and 70 prospective graduates of Diploma 3 of Medical Records and Health Information (RMIK). Prospective graduates with the highest GPA got achievements from the Dean of Faculty of Health. The Dean of Faculty of Health, Dr. Guruh Fajar Shidik M.Cs congratulated all prospective graduates who will be graduated on 29th of August. He also gave some advices to the prospective graduates that they must do their best at their job in the future. "I hope that all graduates could work professionally in the future and able to help many people”, He said. 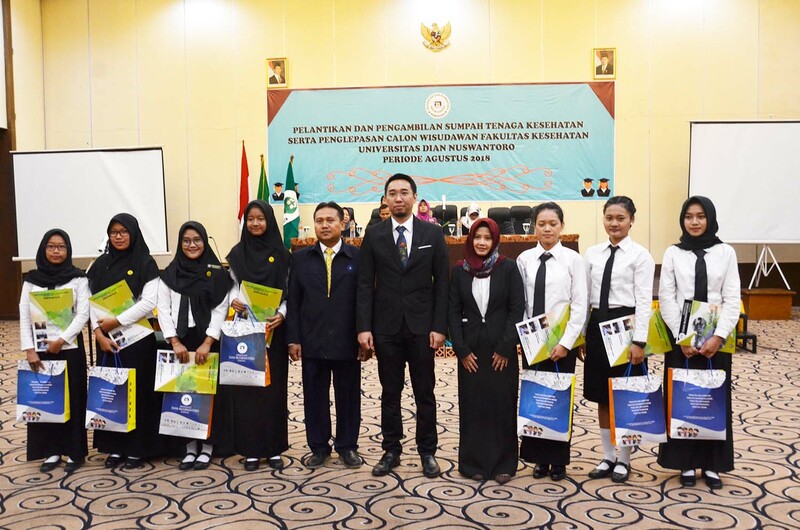 The event was also attended by some institutions such as Perhimpunan Profesional Perekam Medis dan Informasi Kesehatan Indonesia (PORMIKI) which was represented by Sugiarto, Amd. PK, SKM, MH.Kes, Ikatan Ahli Kesehatan Masyarakat Indonesia represented by Irwan Budiono, S.KM, M.Kes, and Dinas Kesehatan Provinsi Jawa Tengah represented by Taufik Kurrachman, SKM , M.Kes. Taufik Kurrachman, SKM, M.Kes as the Head of Health Resources Division of Central Java Government mentioned that universities must be able to contribute to solve problems in the society. According to him, the synergy between the government and universities could make problem-solving easier. "Through the implementation of Tridharma of Universities namely education, research, and community service, problems such as diseases that arise among the society can be prevented as early as possible. UDINUS always provides qualified medical personnel with high competitiveness, "added Taufik. Meanwhile, The Head of UDINUS Public Relation, Agus Triyono, S.Sos, Msi concluded that graduation was not the end of everything but it was the beginning of everything, because after graduation, all graduates would face career world. "We always facilitate UDINUS’ graduates from various departments with job fair after the graduation, so the graduates can find the job that suitable with their competence” He concluded (* PR & Picture by: Alex Devanda).